Blue Pipe® polypropylene-random systems are designed for chilled and condensing water, radiant heating, and industrial applications. Made from more than 98.5 percent pure polypropylene, the piping has natural insulation properties, and they can be installed without insulation and still produce no condensation during normal operation. 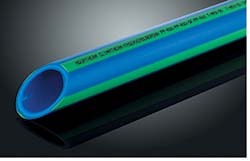 An optional faser-composite layer reduces linear expansion of the pipe by up to 75 percent compared to plastic piping, ensuring it hangs rigidly in operating temperatures up to 200 degrees. The systems come in pipe dimensions ranging from one-half-inch to 24 inches.